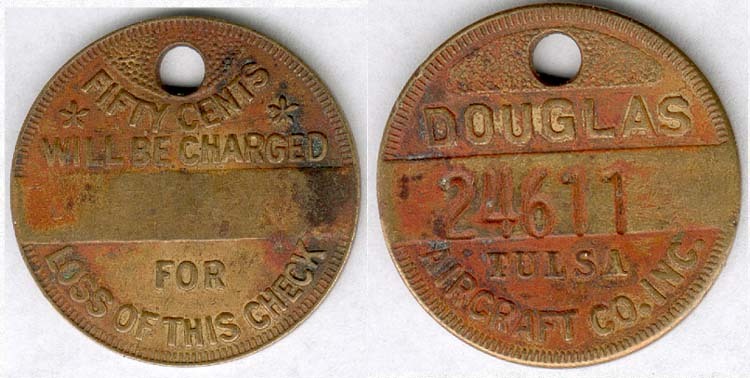 This is a sample of the chits (tokens) that were used at Douglas Aircraft Co.
Dave Wilson was hired shortly after the plant opened, so his tokens would have bore his low seniority employee number which was: #13979. Each mechanic had a small supply of 10 chits bearing their employee number. A chit was exchanged for each part needed – a simple system for keeping track of where the inventory was going. Not sure if this Voice Recording is available or not… (Link does NOT work) I will have to do some investigative work but it would be wonderful to hear. Stay posted! I’ll let you know! WOODHEAD, HARRY. Manager of the Douglas Aircraft Plant in Tulsa comments on the significance of the plant to the Tulsa area. 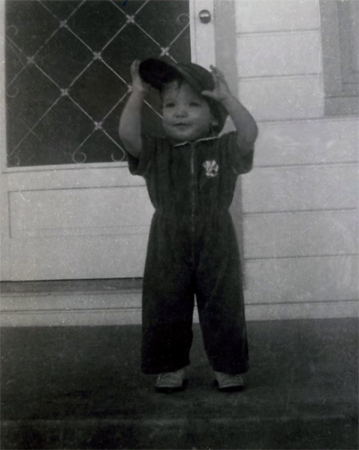 Mar 1, 1951. Reel 50, cuts 11-12. PLEASE NOTE: Currently, these reel-to-reel recordings have not been transferred to another format. Since most of the recordings are in very poor condition and require numerous splices in order to begin the reproduction process, it may be impossible or cost prohibitive to reproduce any or all segments on a reel for our patrons. Level of Description: Reel and Cut number. Name of creator(s): KVOO Radio. Scope and Content: Consists of 181 reel-to-reel sound recordings. The recordings include comments, interviews, and speeches of Oklahoma citizens and public figures, United States congressional and military figures, as well as foreign political and social leaders. The subjects they encompass include social, agricultural, and political issues, natural disasters, crimes, prevalent attitudes towards minorities, and human interest stories, on local, national and international levels. Administrative/Biographical History: The recordings are indexed alphabetically by subject or surname, and are cross referenced when necessary. The current index has been adapted from the original which accompanied the voice library upon its acquisition. The Douglas Aircraft Company was an American aerospace manufacturer, based in Long Beach, California. It was founded in 1921 by Donald Wills Douglas, Sr. and later merged with the McDonnell Aircraft in 1967 to form McDonnell Douglas. It is currently a part of Boeing’s Commercial Airplanes division. It is most famous for the “DC” (Douglas Commercial) series of commercial aircraft, including what is often regarded as the most significant transport aircraft ever made: the DC-3, which was also produced as a military transport known as the C-47 Skytrain or simply “Dakota”. 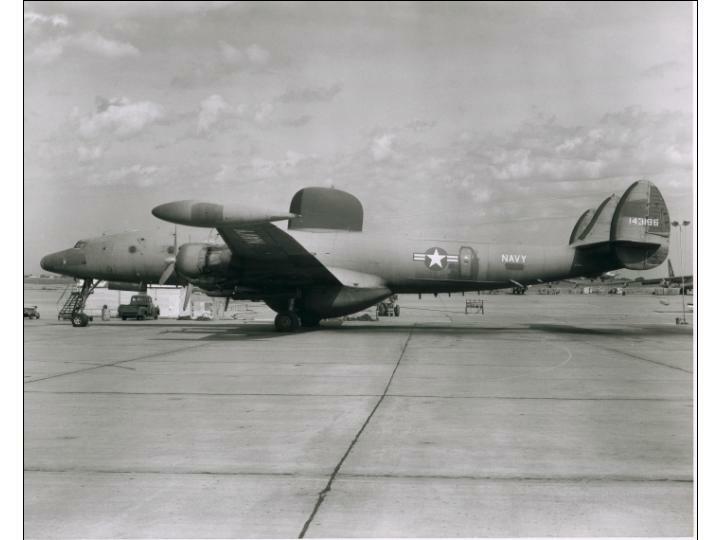 Many Douglas aircraft had unusually long service lives, and many remain in service today. Douglas created a wide variety of aircraft for the United States armed forces, the Navy in particular. The company initially built torpedo bombers for the U.S. Navy, but developed a number of variants on these aircraft including observation aircraft and a commercial airmail variant. Within five years the company was turning out over 100 aircraft annually. Among the early employees at Douglas were Edward Heinemann, “Dutch” Kindelberger, and Jack Northrop (who went on to found Northrop). In 1934 Douglas produced a commercial two-engined transport, the DC-2, following it with the famous DC-3 in 1936. The wide range of aircraft produced by Douglas included airliners, light and medium bombers, fighters, transports, observation aircraft, and experimental aircraft. During World War II, Douglas joined the BVD (Boeing–Vega-Douglas) consortium to produce the B-17 Flying Fortress. 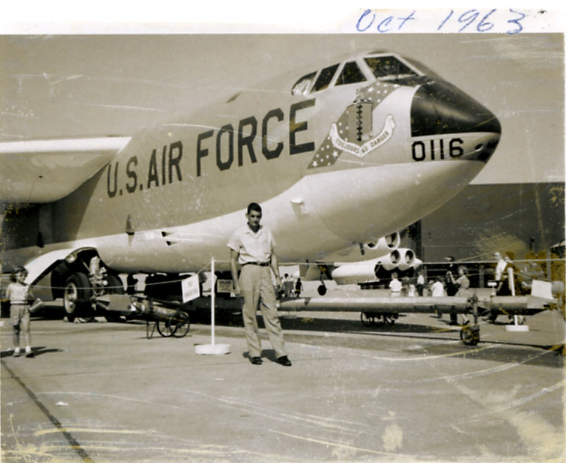 After the war, Douglas built another Boeing design under license, the B-47 Stratojet. Douglas continued to develop new aircraft, including the successful four-engined DC-6 (1946) and their last prop-driven commercial aircraft, the DC-7 (1953). The company had moved into jet propulsion, producing their first for the military – the conventional F3D Skyknight in 1948 and then the more ‘jet age’ F4D Skyray in 1951. Douglas also made commercial jets, producing the DC-8 in 1958 to compete with the new Boeing 707. Douglas was a pioneer in related fields, such as ejection seats, air-to-air, surface-to-air, and air-to-surface missiles, launch vehicles, bombs and bomb racks. 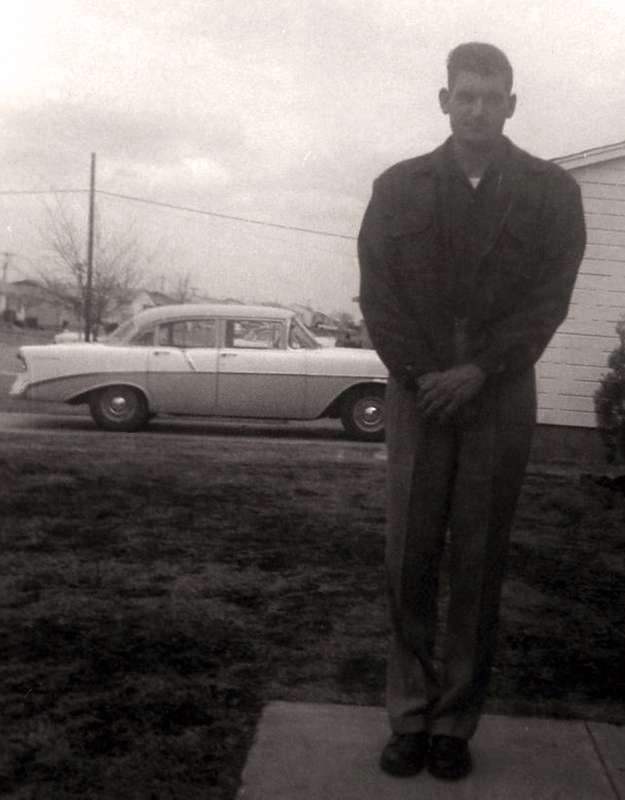 Douglas was eager to enter the new missile business in the 1950s. Douglas moved from producing air-to-air rockets and missiles to entire missile systems under the 1956 Nike program and becoming the main contractor of the Skybolt ALBM program and the Thor ballistic missile program. Douglas also earned contracts from NASA, notably for part of the enormous Saturn V rocket. In 1967, the company was struggling to expand production to meet demand for DC-8 and DC-9 airliners and the A-4 Skyhawk attack plane. Quality and cash flow problems, combined with shortages due to the Vietnam War, led Douglas to agree to a merger with McDonnell Aircraft Corporation to form McDonnell Douglas. Douglas Aircraft Company continued as a wholly owned subsidiary of McDonnell Douglas, but its space and missiles division became part of a new subsidiary called McDonnell Douglas Astronautics Company. McDonnell Douglas later merged with Boeing in 1997. 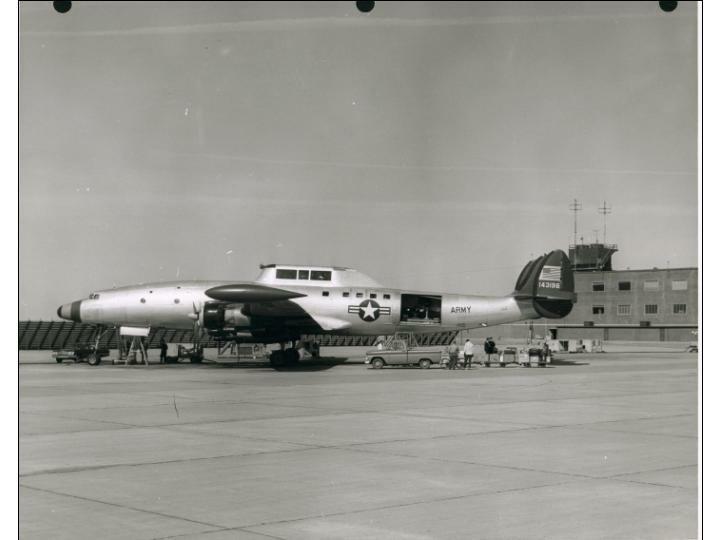 Boeing combined the Douglas Aircraft Company with the Boeing Commercial Airplanes division, ending more than seventy-five years of Douglas Aircraft Company history. The last Long Beach-built commercial aircraft, the Boeing 717 (a third generation version of the Douglas DC-9), ceased production in May 2006. The C-17 Globemaster III is the last remaining aircraft being assembled at the Long Beach facility, as of 2008. You are currently browsing the archives for the Douglas Aircraft Co. category.